The photos from our pre-wedding shoot are finally out so here's a sneak peek! Out of everything about the wedding, I'm most particular about the photography because at the end of the wedding, in 10-50 years time, the photos are the only thing that we'll have to look back on and remember the day we celebrate our love. So we didn't mind paying a little more for photography to make sure our wedding moments are captured as perfectly as possible. Shane and I took our pre-wedding photos somewhere mid this year & we engaged Melvin from Multifolds (yes, we paid for it. This is not a sponsored post, NOT AN AD) after seeing one of our friend's album during their wedding reception. 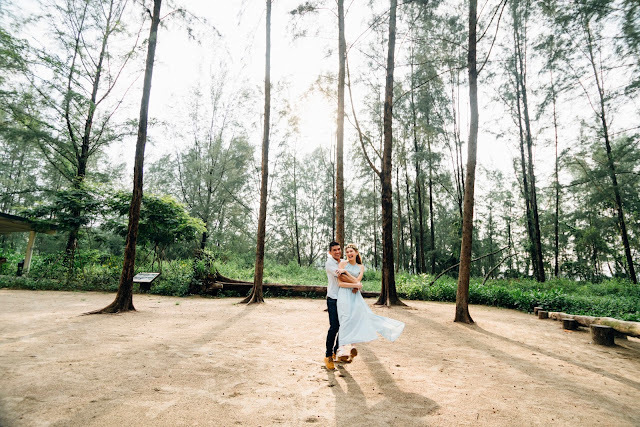 We were really impressed with his shots and how he managed to capture the couple's love and joy so genuinely. Plus, he also managed to make the whole shoot look like it's shot overseas! Who knew Singapore had such scenic places?! I was never a fan of the pose-y, stoic studio shots where couples seem to have rigid/awkward smiles on their faces despite the glamour of a suit and gown. 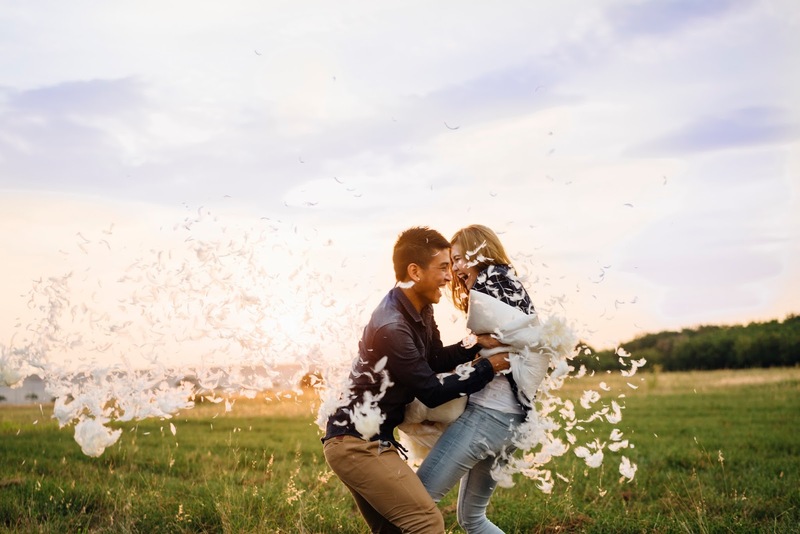 If anything, I wanted the shoot itself to be a day of memories and laughter worth remembering, not just a day posing in front of the camera so the moment we saw what Multifolds could produce, we were bent on having him as our wedding photographer! If you're wondering why we're not in a suit and gown, well that's because we're following his family's western culture/tradition in which the groom doesn't see the bride in her wedding dress until the actual day itself when she walks down the aisle! When we were discussing the styling of the photo shoot, Shane brought up the idea of going forth with a rainy weather shoot should it pour that day which somewhat surprised me cause he's usually pretty "conventional" when it comes to stuff like that. & although there wasn't a downpour, there was a slight drizzle when we first started and the cloudy, dusky sky gave a some what "Twilight" feel (If you've watched the movie, you'll understand what I mean). The thing I love about Melvin is his ability to create these moments and capture our genuine smiles and laughter. He has all these ideas to help us connect with each other during the shoot and even has a playlist on to get us into the "love-drunk" feel and mood. The sun came up after and as we headed to our second destination for the shoot, we were welcomed with an amazing sunset! I don't know what we were thinking then but we look soooo connected in this photo, like we both just got lost in each other's gaze and forgot about the world! Melvin's magic really! & Can you believe these were all taken in Singapore?! 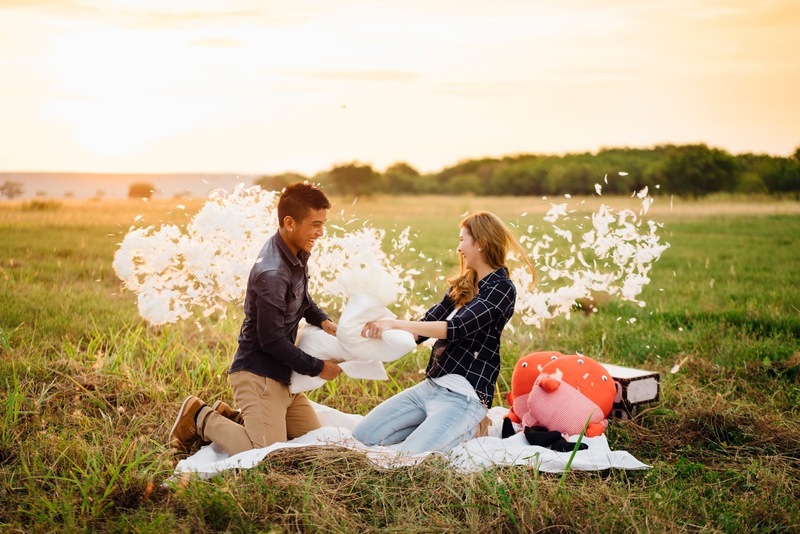 I also had this crazy idea of having a pillow fight during our shoot and much to my delight, both Shane & Melvin were super psyched on the idea too! The outcome of our pillow fight shots were pretty darn epic! So happy with how all the photos turned out - happy is an understatment! Because I've been following Multifolds on Instagram, I've also seen some of his night shoots in which he uses fairy lights to illuminate the couple and create a really romantic setting so I wanted that for our shoot too! It's a pity it's pretty impossible to take those epic starry night shots that he does with some of his couples because Singapore's light pollution is quite bad so we had to forgo that but nonetheless, the photos still looked so pretty!!! So that's pretty much all that I will reveal for now! don't want to spoil everything for my wedding (#ShaneandEstherweds) guests so I'll wait till after the wedding to do a full blog entry on the rest of the shots we took! Just a little over a month left before our big day! Can't wait to finally be able to put on a wedding gown like I've always dreamed of and meet my man at the alter! Until then, watch these space for more wedding updates!! !